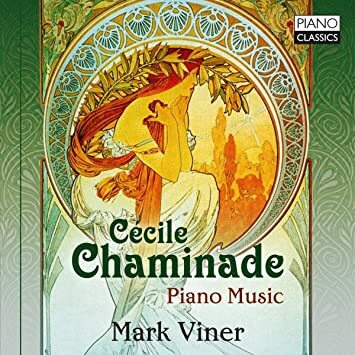 It was in December 2017 that I posted on CMG's forum about the incredible British pianist, MARK VINER. My thoughts were running to his Liszt,Thalberg, Alkan, and others of that ilk. I had some correspondence with the pianist wherein I asked him for MORE. Well we have more. And, every one of his CDs thus far is a pianistic gem. Cécile Chaminade, born in Paris in 1857 and died in 1944. A fabulous pianist, but more, a composer of piano music that is immediately entertaining and ravishing in many ways. Her music is enough to fill an evening with delightful melodies, both heartfelt and virtuosic, and has much to say emotionally. I may be old-fashioned, but this is music that remains close to my heart. 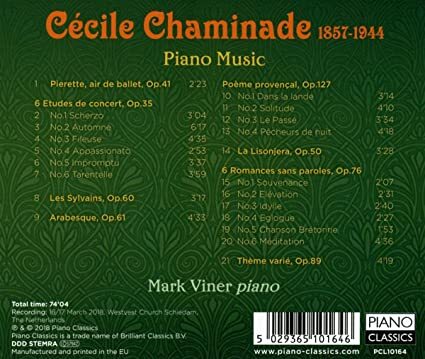 Chaminade's music fits well into the "golden age" of piano playing. When Chaminade came to America in 1908, audiences fell in love with her. It is easy to understand why in listening to this recording. The recording was made in March 2018 in The Netherlands in an acoustically perfect church. Viner plays with touching poetry throughout this disc, and he plays it with deep expression. The virtuosity is there but never overshadows the art of the music itself, which offers a kaleidoscope of colour. The disc is beautifully recorded, and a superb piano (sounds like a Steinway), with a booming bass, and singing mid-to-treble, and is perfectly balanced. 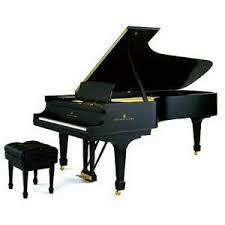 The pianist was born in 1989, and now 30 years old, I would place him in the forefront of present-day pianists. I am reminded of what tenor Beniamino Gigli once said: "They call me the new Caruso. No! I am the first Gigli!" Some may call Viner the new Horowitz; instead he is the "first Viner." He deserves his very own place. If you acquire only one solo piano disc in 2019, this should be at the top of your list. RATING: ***** (or more) stars! Thanks Lance. It's on my list! Thanks for suggesting this pianist I have not heard before ! Complete performance at Gusman Concert Hall at University of Miami in Coral Gables FL. The Pianistic Encounter of 1837 Between Liszt and Thalberg at the Salon of the Princess di Belgiojoso. Well Lance, your recommendations are pretty good. I might see if I can follow this up. BTW, I got a Christmas card email from Goran Filipec. Really kind. I can assure, you that you will NOT be disappointed. I listened to it three times thus far! We have some top pianists amongst us these days! It is like living the "golden age" all over again! I am preparing TWO radio rograms on the pianistic art of Mark Viner, February 9 and February 16, 2019. Hope you can tune in. Lance, I just opened this new disc from Mark Viner and I must say, I am mightily impressed with his playing. Chaminade's music is quite a bit more than salon quality: she definitely has a voice all her own, and it's sad that she's been so forgotten. Wonderful to hear: I'm captivated by her music and Mark Viner's playing. Thanks for recommending this disc. It's a fine one.